Home/Faith/Are Christians Supposed To Have a Blind Faith? To Richard Dawkins (and many others), faith is the opposite of reason. This plays out in one of my favorite Christmas movies of all time: A Miracle on 34th Street. Towards the end, when the little girl loses her “faith” that Kris Kringle is Santa Clause, her mother encourages her she needs to keep believing in Santa Clause because “Faith is believing in things when common sense tells you not to”. The girl – quite correctly – responds with a puzzled “huh?”. It’s almost as if we could substitute faith with “wishful thinking”. Do we really live our lives this way, though? Do we withhold actions until we can prove through scientific tests that we will be successful? The answer, of course, is no. Being so dogmatic on having to prove everything would make us terribly unproductive. Think of it this way; when you sat in your chair, did you first inspect the joinery holding it together, or use some sort of force gauge to see if it would hold you before you sat down? No, you didn’t. You know what chairs are for, you know what they are supposed to do, so you sat in it and didn’t give it a second thought. I trust that the chair will hold me before I sit in it. On a more personal level, when I am at work, and my wife and kids are home after school, I don’t feel the need to have some sort of video camera so I can keep an eye on her. Nor do I feel the need to call her constantly to make sure everything is OK. I have faith in her as a mother. Why? Because experience has taught me that she is an amazing and trustworthy mother to my kids. My faith in her isn’t something that I hold blindly just because. I have developed trust in her through our relationship. This is all fine and good. But, our topic today is biblical faith. So, if we want to know how Christians are supposed to think about faith we need to look in the Bible. So, when the authors of the New Testament wrote about faith, did they have the same definition as Richard Dawkins and Ms. Walker? Did they really mean we should just sit down, shut up, and believe with no reason other than “just because”? Did the New Testament authors tell us to not ask questions and resist rationality? In the original Greek of the New Testament, the word used for faith is pistis. This word doesn’t mean “belief with no reason”; it means conviction of the truth; trust; faithfulness. When the New Testament was translated to Latin, the word used was fides, which means “trust”. All of these definitions imply some sort of relationship or experience with the party or thing in question. In other words you have reasons. You didn’t decide to have faith in someone/something “just because”. You have faith in that person or thing based on prior experience and a developed relationship. This concept of belief based on reason is played out all through the Bible. When Moses is talking to God at the burning bush, he tells God that the people won’t believe what he has to say. Does God say “Moses, you go back there and tell them they just gotta believe”? No. He tells Moses to perform various signs as evidence that what he says is true. Throughout His ministry in the Gospels, Jesus routinely performed miracles of healing, feeding the masses, controlling the weather and raising the dead. Each of these miracles served a specific purpose in affecting the specific subject – the blind man could now see, the lame man could now walk, the 5000 had something to eat, and Lazarus came back to life – but they also served a bigger purpose. They were evidence that Jesus was who He said He was. He didn’t just walk around, doling out wisdom and telling people “hey, I’m God in the flesh aaaaaaand… you just gotta believe me when I said it”. No! He performed miracles as proof that he was who He said He was. And the biggest proof of all was He returned from the dead! He told the apostles he was going to be captured, tortured and put to death. And then He would rise from the dead. And it wasn’t until the disciples saw this happen that they truly believed Jesus was who He said He was. One of my favorite examples of Jesus providing evidence for His nature occurs when John the Baptist is in prison. Here is Jesus’ cousin, the man who had been proclaiming His arrival, and who had been baptizing people in Jesus’ name. He even baptized Jesus and witnessed God proclaim from the heavens “this is my Son with whom I am well pleased”. Jesus had called John the most holy man on earth. So, here is John, sitting in Herod’s dungeon. And he begins to have doubts. So, he sends some of his disciples off to ask Jesus “are you really the Messiah”. Now, if it was me, I would have looked at those guys and said “John should know better. He’s known me all my life and seen me do enough. You go tell that guy to chill out and just believe me”. Thankfully, Jesus didn’t handle it the same way I would have. Instead, He had John’s disciples watch as He made the lame walk, cured the blind, cured leprosy and raised people from the dead. Then He says “OK, go back and give your report to John on what you have witnessed.” In other words, He gave John’s disciples (and therefore John) evidence that He was the one John was looking for. He didn’t encourage John to have a blind faith. 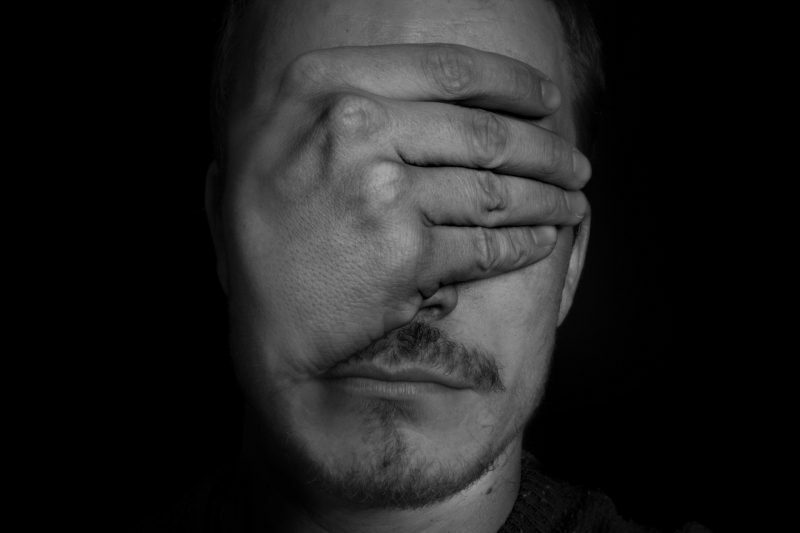 Why Do Some Christians Have Blind Faith? Now, don’t get me wrong; Christians with blind faith certainly do exist. I would say a great number of us think we can’t ask questions and we should “just believe’. The idea that we should have a blind faith and not ask questions usually comes from an incorrect interpretation of two passages in the Gospels. The first is Matthew 18:2-4 when Jesus tells us that the greatest in Heaven are those who are like children. Now, this certainly didn’t mean “don’t ask questions”. Anyone with kids knows they ask A LOT of questions. Because they have a desire to know the world around them. The difference between children and adults in this particular passage is that children do so with humility and a joy to know. They are also excited when they receive gifts. And, Jesus was offering the greatest gift of all – eternal life. Adults, on the other hand, often bring pride, ambition, and arrogance into the equation. These things get in the way of us truly humbling ourselves before God. So, this passage is about being humble, joyful and in wonder of the gift we have been given, and not “don’t ask questions”. John spells out his purpose at the end of his gospel. He wrote down only a handful of the possible pieces of evidence that we would need to believe that Jesus is the Messiah so that we, too can be saved. As you can see, having a blind faith is unbiblical. Our faith is built on trust and evidence. It’s not just wishful thinking. Having a blind faith can also be very dangerous when it is used to abuse others by people of authority. We’ve talked about the need for discernment before. The Bible teaches over and over that we are to “test the spirits”; in other words, don’t just follow things without thinking them through. Christianity is not a world view that says there must be blind obedience. Scripture tells us over and over again that we need to know what it teaches so that we can discern the truth when something comes into question. We need to weigh the evidence and come to the truth. “Faith is not belief in spite of the evidence, but belief in light of the evidence” -Sean McDowell, Is God Just a Human Invention? Sometimes in our conversations with nonbelievers, we use language and terms that they don’t understand. Or they have an incorrect definition of. “Faith” has become one of those terms. Even secular people use it in conversation when they talk about things that aren’t even religious. And, when they use it they mean “wishful thinking”. Or “believing in spite of reason”. So, rather than waste too much effort on redefining faith, I would encourage you to start using words that portray what our faith is really supposed to be. Words like “trust” or “conviction. This is what we are supposed to have. I put my trust in Jesus because I have studied what he taught and I think he got it right on the way the world works. I have a strong conviction on various issues because I have seen the way God works in the world around us. Now, I could have used the word “faith” in those sentences, but using trust and conviction drives home that my beliefs stand on solid reasoning and evidence. In the end, we should not be the kind of Christian who believes simply because they want or need it to be true. Leading a blind faith is dangerous and can lead you down the wrong roads or over a cliff. Blind faith isn’t taught in the Bible. Asking questions is a way to come to know God just as you would ask questions to come to know anyone else. No, the Bible does not encourage us to believe “just because”; it encourages us to trust in Jesus based on reason and evidence evidence, and come to a rational conclusion on the truth of Christianity.